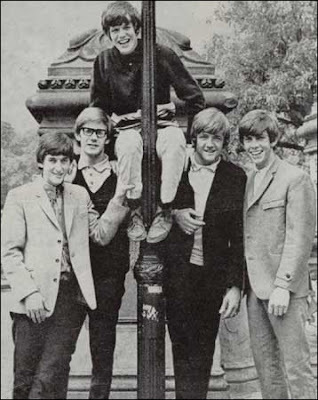 It was on this day in 1967 that Herman's Hermits started their biggest US tour, with opening act The Who. When you think of Herman's Hermits you inevitably think of the quirky, simple pop songs that propelled the band to the forefront of the British Invasion in 1964 well ahead of The Beatles and The Who. In 1965 the Hermits were the top selling pop act in America, and through the mid-60s had two #1s and a string of top 10 hits. These ranged from the pop of "I'm Into Something Good" to the campy and catchy "Mrs. Brown You've Got A Lovely Daughter" to the quirky vaudevillian song "I'm Henry The Eight I Am" which was first recorded in 1911. However, in the beginning they were a serious R&B band, playing the hip shakin' R&B hits of the day. The band suffered from being over managed, not unlike other bands of the mid-60s like The Yardbirds, The Animals, The Monkees and a host of others. Thneir management wanted a clean cut teen friendly band, and that's what was delivered. With a tremendous amount of success to the tune of over 50 million albums. In 1967 they released their final MGM album, their most mature and best to date, but it was doomed by the summer of love and the rise of psychadelic freakbeat. The song feature here, "Moonshine Man" was perhaps the best track from that underrated album. The popularity and commercial viability of that clean cut sound died away in the late sixties, and by 1971 the band was over. There have been lots of reunions, but none that include all the original members. You can see The Official Herman's Hermits sans lead singer Peter Noone, or you can see Herman's Hermits starring Peter Noone, but sadly both amount to little more than tribute bands. Since when is Barry's band official? Unless I have misunderstood the court ruling, Barry may use "Herman's Hermits Starring Barry Whitwam. "Peter may use "Herman's Hermits Starring Peter Noone."